There are several fields of industry where accurate network traffic monitoring and inspection is a key factor of success. Participants of these areas realized the importance of fast packet processing, reliable data handling and security, consequently a new demand arose for devices being able to satisfy these needs. AITIA also recognized this newly born market demand and found the optimal solution for the problem in its highly flexible, reconfigurable and fast FPGA-based SGA interface cards. AITIA’s cards can be programmed to solve all the problems of companies mentioned above. 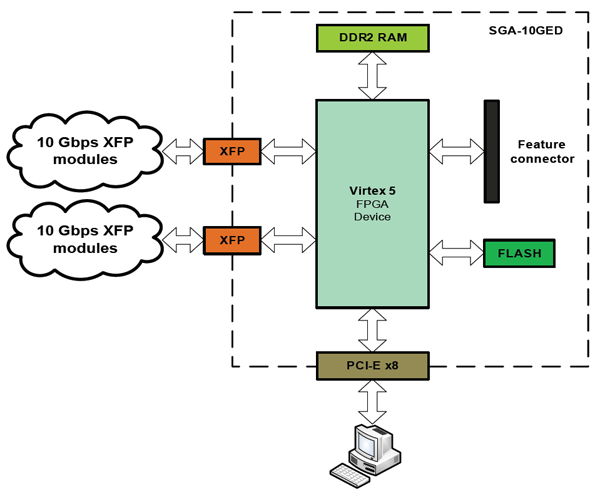 The user-defined logic running on the FPGA can realize a wide range of networks applications such as firewalls, different layer routers or switches, traffic generators or analyzers etc. The technological development goes along with an increase in bandwidth and data rate requirements, thus network devices have to face quickly growing load (up-to 10 Gb/s per connection) of the so-called next generation networks (NGN). AITIA’s solution for handling NGN infrastructure is the SGA10GED interface card. 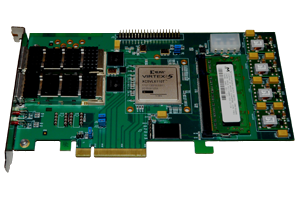 Compared to competitors, AITIA’s leading-edge card offers ultra high speed data processing and transfer rates supported by its Virtex 5 FPGA core chip, its x8 PCI-E slot and two XFP slots. Besides the firmware AITIA also offers sample applications to help developers create their own codes.